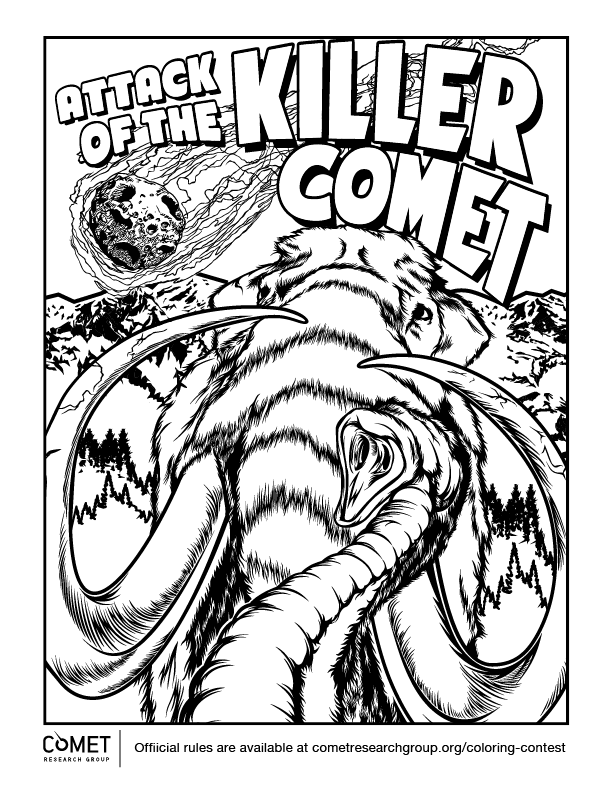 Visit cometresearchgroup.org to download our coloring sheet featuring the “Attack of the Killer Comet”. Or, you can draw and color your own killer comet-themed entry. Color the sheet with crayons, markers, colored pencils or other favorite art supplies. Children can use their parents’ social media accounts if they do not have their own accounts, just add a name for each entry. Note that self-drawn entries will also be a separate category. Contest will run in conjunction with our upcoming Indiegogo campaign and will likely conclude Nov. 30, 2016. Entrants from October 15 through November 30 will be judged by Comet Research Group executive team and professional artist, JP Edwards, who illustrated the coloring sheet. The winners will be announced the following week. Criteria will be use of color, creativity, and overall effect. A winner in each category will win a variety of prizes, including free swag from the Comet Research Group and more. For help or additional information, email [email protected].